Morris and wife June Morris together are the Marquis and Marquessa du Vin of the annual world-class culinary indulgence. The Allen Morris Company is pleased to announce that Chairman and CEO W. Allen Morris is the Chair of VeritageMiami wine and food festival for the second consecutive year. Celebrating its 21st anniversary, VeritageMiami takes place on October 5, 6, 7, and 9. Along with his wife June, they are the Marquis and Marquessa du Vin of the world-class culinary indulgence which benefits United Way of Miami-Dade’s work in education, financial stability and health. On October 5, guests will enjoy a Craft Beer Tasting featuring more than 100 craft beers and micro-brews complimented by delicious bites from dozens of local restaurants amidst the eclectic and vibrant backdrop of Wynwoods Walls. On October 6, guests are invited to the Fine Wine Tasting, an evening of unparalleled wine and food pairings at the lush Shops at Merrick Park, with more than 65 wine producers and importers pouring 300 wines from around the globe and culinary treats from top dining spots. On Friday, October 7, Jeremy Ford, winner of Bravo’s “Top Chef” season 13 and the chef de cuisine at The Miami Beach EDITION’S Matador Room by Jean-Georges Vongerichten, will headline VeritageMiami’s Interactive Dinner at the JW Marriott Marquis Miami. More than 700 energetic guests bravely sport cooking aprons and toques as they prepare a three-course meal under the direction of Chef Ford. VeritageMiami will culminate on Sunday, October 9 with an Auction and Bubbly Brunch at The Ritz-Carlton Key Biscayne led by the king of southern fare John Kunkel and his 50 Eggs Inc. team of James Beard-nominated and award-winning restaurants Yardbird Southern Table and Bar, Swine Southern Table and Bar and Spring Chicken. Award-winning wines from the Best in Glass Wine Challenge and plenty of champagne will be paired with the three-course brunch, and one-of-a-kind experiences will be auctioned off. For more information or to purchase tickets visit www.veritagemiami.com. The Allen Morris Company is one of the largest real estate firms in the Southeast U.S. specializing in commercial and multi-family residential development, leasing, property management, and brokerage. With offices in Miami, Coral Gables, Fort Lauderdale, Orlando, Jacksonville, and Atlanta. The Allen Morris Company has served its business and investment clients for over 58 years. For more information, please visit www.allenmorris.com or follow us on Facebook at www.facebook.com/TheAllenMorrisCompany or in Twitter @allenmorrisco. 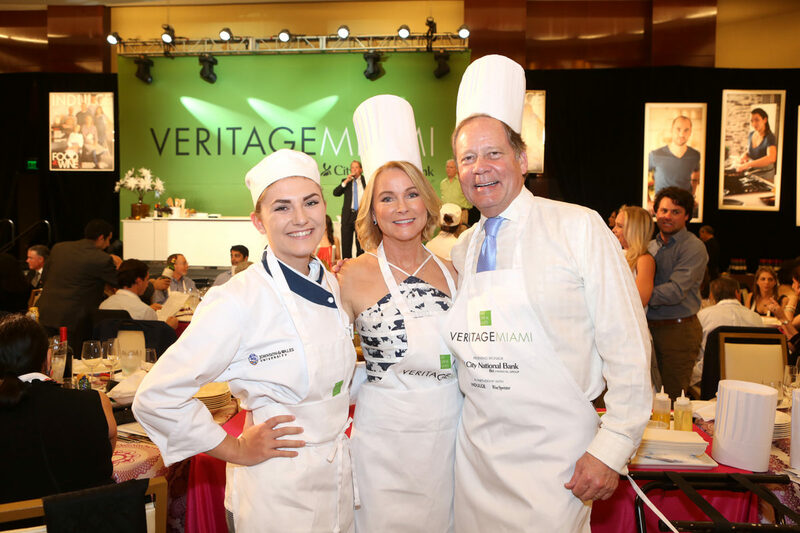 The annual VeritageMiami brings together wine, spirits, beer and food lovers, as well as top sommeliers, notable chefs, prestigious wineries and winemakers, breweries and impressive auction lots, all to benefit the South Florida community. Celebrating its 21st year, VeritageMiami uncorked some added cheer, serving up five days of world-class culinary indulgence in 2016. Events began with Spring Edition, a one-night Interactive Dinner, which was held in March, and conclude with four days in October. VeritageMiami benefits United Way of Miami-Dade, supporting programs in our community that are focused on improving education, financial stability and health – the building blocks for a good life. For more information, visit www.VeritageMiami.com, www.facebook.com/VeritageMiami, www.Twitter.com/VeritageMiami and www.instagram.com/VeritageMiami.